Volvo machinery was used to demolish Bedouin houses in the Palestinian village of Abu al Ajaj on Wednesday 24th November 2010. 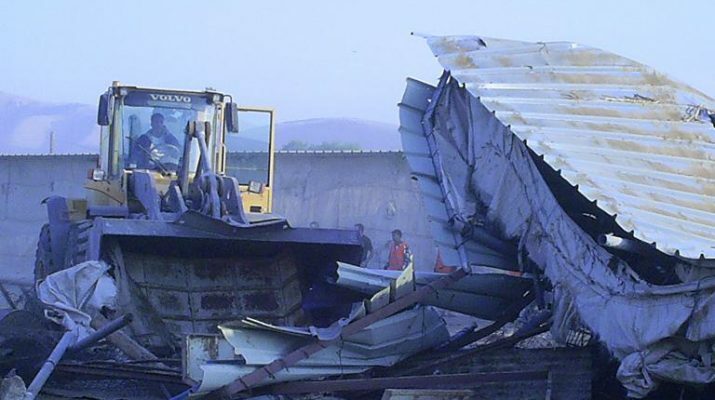 The same week, a wave of demolitions occurred across the West Bank and Israel, including the demolition of the village of Al Araqib in the Naqab (Negev). Abu al Ajaj is situated in the Al Jiftlik area of the Jordan Valley, in the Israeli occupied West Bank, next to the Israeli colony of Massua. At 5am two Volvo bulldozers and 200 soldiers raided and demolished one house and three animal shelters in the Abu al Ajaj. Three tin buildings and one tent were also destroyed. Two men were arrested and several injured. 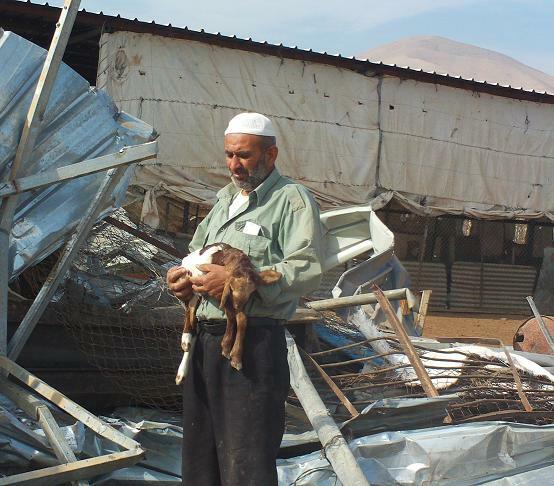 Several baby goats were killed and many were injured in the destruction. 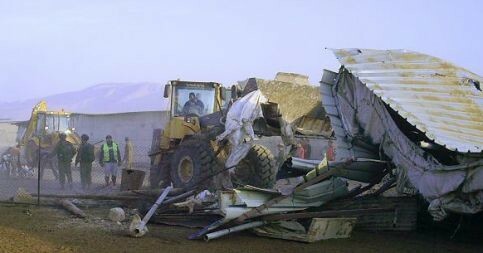 The estimated cost of the damage stands at around 120,000 NIS. The demolition paves the way for the expansion of the settlement of Massua, which lies opposite Abu Al Ajaj across the highway. Massua was established, in contravention of international law, on the site of a Palestinian refugee camp. Over the last six years the settlement has been increasingly encroaching on the land of Abu al Ajaj. In 2004 settlers from Massua annexed some of the land of Abu Al Ajaj and erected greenhouses. In 2008, residents in the area were issued demolition orders by the civil/military administration on the grounds that the land was government land. In October 2010 settlers fenced off a further patch of land belonging to the Palestinian community prompting protests and arrests. The recent demolitions in Al Araqib are the seventh time the village has been demolished since July 2010. Al Araqib was originally ethnically cleansed in 1951 by the Israeli army. By the 90s the original inhabitants had repopulated the area, living amongst the ruins of the original village. However, Al Araqib is designated ‘unrecognised’ by the Israeli state. The Jewish National Fund (JNF) plans to plant a forest over the village. To this end, demolitions of Al Araqib have been carried out by the Israeli Land Administration (ILA), a parastatal organisation whose board of directors is dominated by the JNF. 50 families from Al Araqib remain in the village, in the ruins of their homes. 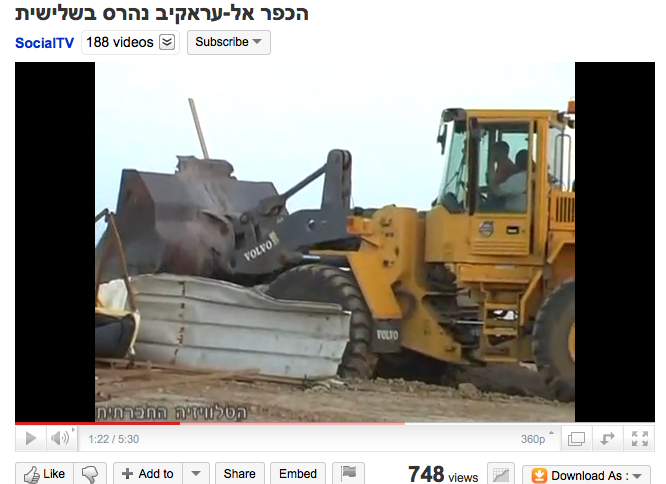 The demolitions in Al Araqib, which took place on 10th August 2010, by Volvo machines, can be viewed here. 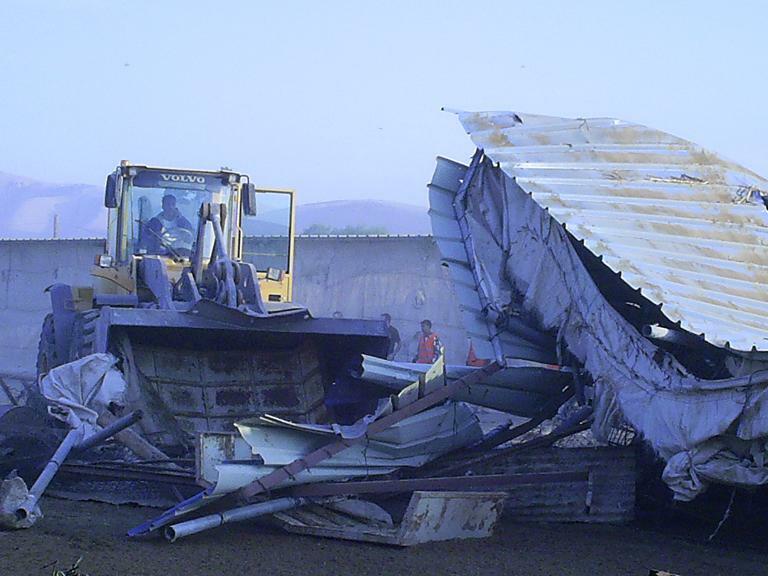 Volvo machines are consistently used in home demolitions and settlement building in occupied Palestine. Corporate Watch observed Volvo machinery working on settlement projects in Ariel, Givat Hamivtar and Mod’iin Illit and quarrying occupied Syrian territory near Merom Golan during 2010. Adri Nieuwhof, in a recent article for Corporate Watch, detailed house demolitions using Volvo machines in Wadi Qadum, Silwan, Beit Hanina, Atir, Um Hayran and Al Walaja. The demolitions in Al Walaja were to make way for the construction of a new section of the apartheid wall. Volvo Group’s vice president of media relations and corporate news, Marten Wikforss has said “we do not have any control over the use of our products, other than to affirm in our business activities a Code of Conduct that decries unethical behaviour.” Volvo has not attempted to investigate the use of its equipment in Palestine. 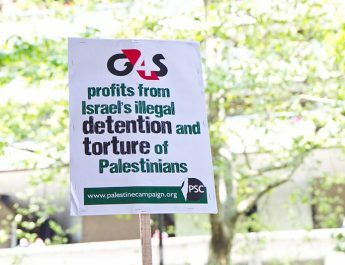 However, on 14th October 2010, another equipment hire company, Riwal, had its offices raided and documents seized in Holland after a Palestinian human rights group, Al Haq, complained that it was complicit in the building of the apartheid wall. Questions about Riwal’s involvement in the building of the wall had first been asked in the Dutch parliament in 2006 after a Dutch television crew filmed cranes active in construction of the apartheid wall, and of settlements, which bore the Riwal company logo. As a result, the Dutch Government, in 2008, warned Riwal not to engage in activities in the ‘occupied territories’. The International Court of Justice’s ruling on the apartheid wall in 2004 had ruled the wall illegal and obliged states to ensure that no support is given for further construction. Volvo’s sole representative in Israel is Mayer Cars and Trucks. Racism is racism, apartheid is apartheid, it doesn’t matter one bit how you justify it. The crimes of Israel against the Palestinians are still crimes. As was demonstrated clearly by its uselessness and lack of expertise in the recent firefighting fiasco, without US and European support, Israel is just a collection of failed bigtalking criminals. Without help from Europe and the US the Zionist state would have had to shut up shop decades ago. Without Catapillar and Volvo and the like, there would be no house demolitions in Palestine. 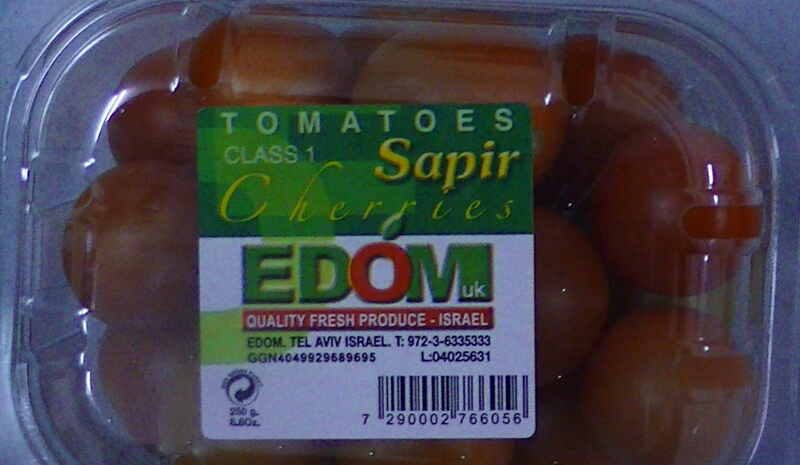 The antedote to the Zionist takeover of Palestine is total BDS.